Very Good+ in Very Good dust jacket. 0815603444. 9.32 X 6.30 X 0.84 inches. Very Good. 0815603444 Very good condition, binding and pages crisp and clean. Dust Jacket is crisp and clean. Fine. 0815603444 Syracuse University Press hardcover with dust jacket, 1996, 1st edition, unused, No marks/tears or other defects, as New/Fine (like New); We will add a custom fitted mylar cover, bubble-wrap the book and ship it in a BOX with delivery confirmation/tracking. Syracuse NY: Syracuse University Press, 1996-First Edition-Very Good+/ near new hardcover/ Very Good dust jacket-9.25" tall-natural cloth covers, green lettered on spine-b/w photos-prev owner name on front endpaper, otherwise as new-xviii + 188 pages. 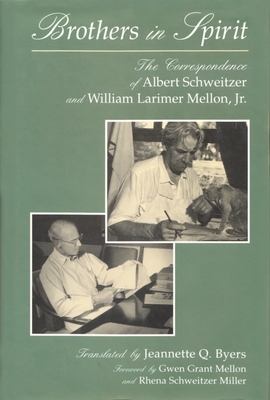 Foreword by Gwen Grant Mellon and Rhena Schweitzer Miller. ISBN: 0-8156-0344-4. Like New. New copy. Clean. May have age wear. Fast Shipping. APO, FPO welcome. Fine in Fine dust jacket. . Hardcover. Syracuse University Press, 1996. 1st Edition/1st Printing. Fine Book in Fine Dust Jacket. Overall, a clean and tight copy to add to a collection or read and enjoy. Dust Jacket protected with a new archival cover. Bubble wrapped and shipped promptly in a box. Fine in Fine jacket. Translated by Jeannette Q. Byers. frontis, xviii, 188p. 23cm. INSCRIBED by the translator (as "Jenny") in 2010.